I absolutely love to play matchmaker. Setting two people up that may never have otherwise met is such a rush for me. Of course, it's only possible that these said people want to be with someone. Trying to fix someone up that is perfectly happy being single is like trying to feed bacon to a vegetarian. Yeah, it ain't happening. If someone wanted to be in a relationship, they knew who to ask and where to go. Well, that is until I moved here. Back home, I was the Patty Stanger of matchmaking, if you will, and yeah, I was bloody good at it too. I don't normally toot my own horn, but I really was. In fact, I was responsible for putting together quite a few long-term relationships that resulted in several (FOUR, thankyouverymuch) marriages. The couples that married are still together and have nine babies between them. The longest long-term relationship lasted eight years and the shortest lasted just over three years. It's unfortunate, because the couple with the three year relationship was so good together, and I mean like, so good. They were the couple everybody wanted to be. I'm pretty confident it would have ended happily ever after, but the girl didn't want to move 3,000 miles across the country and leave her family. Understandable I suppose as they were super close, but I often wonder if she feels regret not going with him. You know, the one that 'got away'? I wish I had the ladyballs to ask, but sometimes it's best to let sleeping dogs lie. When I moved here, I met so many amazing, single people; it was like hitting the jackpot. Unfortunately, my luck barely got a running start. Imagine walking into a casino with a sackful of free quarters and striking out at every go. It was so hard to get people on board. Either the girl backed out at the last minute or the guy forgot he had 'other' plans. It was excuse after excuse - and so frustrating. These same people continue to complain how they either date losers or can't get a date. *SIGH*. Seriously? Platter. Future spouse. Hello? However, just as I was about to throw in the towel and seriously doubt my abilities, *GASP! *, I set up a friend of mine with one of my husband's colleagues. Turns out, I did real good. They were married within the year and now have a gorgeous little boy. Every now and again, I like to do that to my food. Chocolate and peanut butter is one of my most favourite food combinations, but sometimes I like to pair it with pretzels or cookies. Or Caramel. Like this tart. So rich and so delicious. In a mixing bowl, whisk together flour, sugar, and salt. 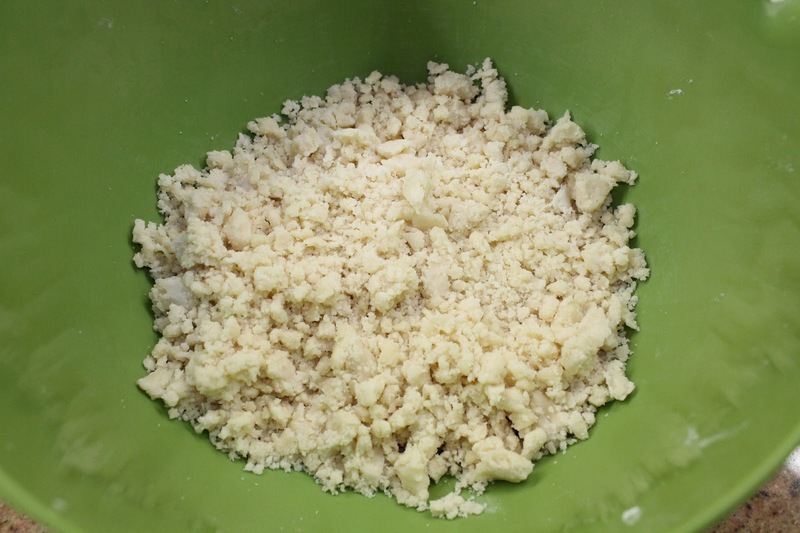 Cut butter into flour mixture until it resembles coarse crumbs. 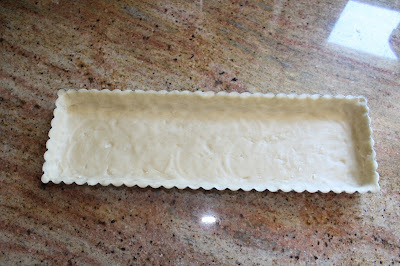 Press dough into a rectangle tart pan. 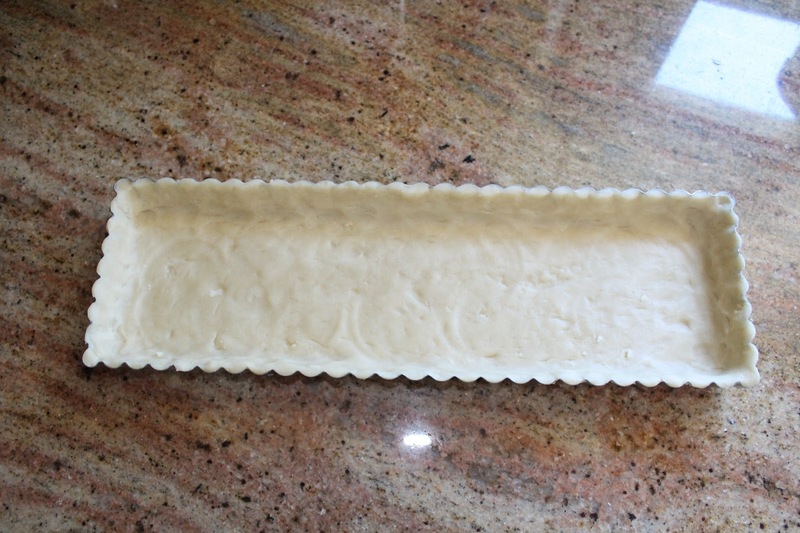 You can also use a 9" round tart pan, but for presentation of this particular tart, I prefer the rectangular pan. 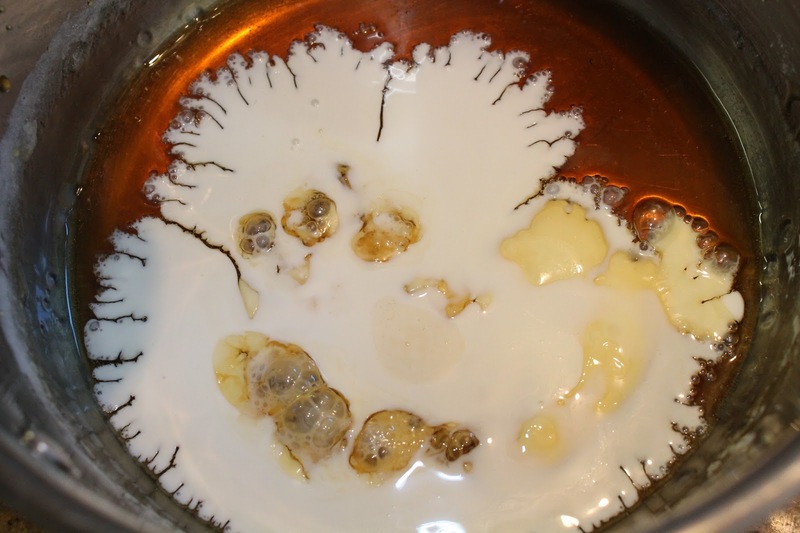 In a medium saucepan over medium-low heat, combine sugar and water. Stir until sugar is dissolved. 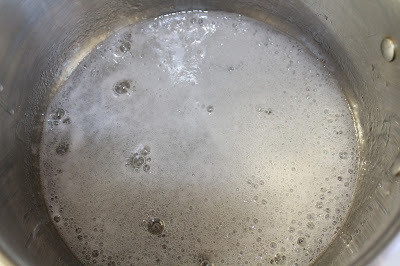 Increase heat and allow sugar water to boil for about 7 minutes. 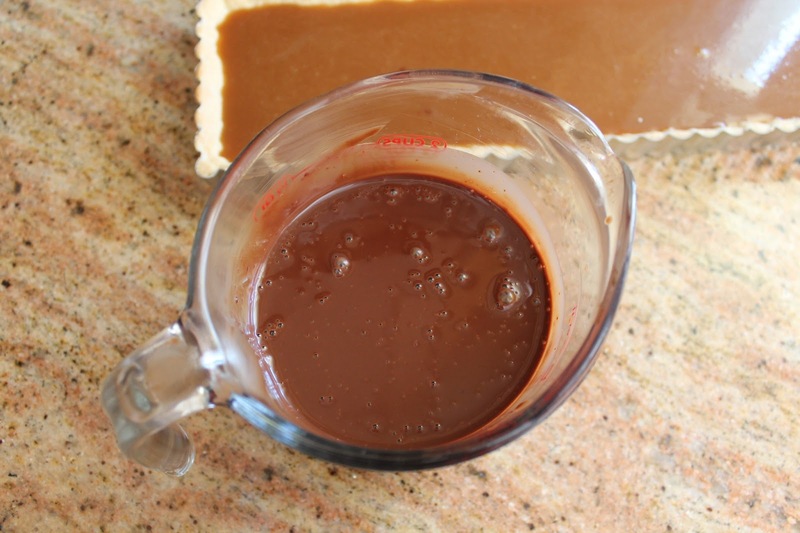 This particular caramel recipe does not require a candy thermometer (which is why I love it so), but be sure to stay very close to pan and watch carefully or the sugar will turn on you and burn in the blink of an eye. You'll be looking for a caramel colour - or the colour of beer. 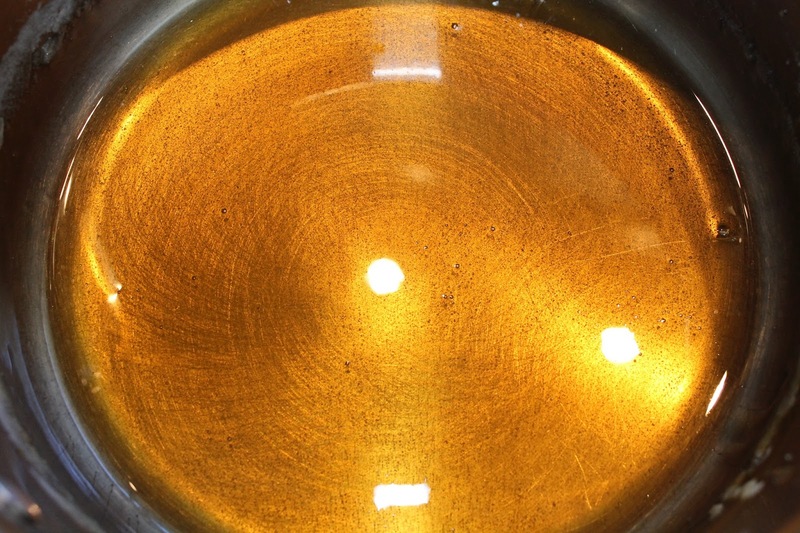 Once you see sugar go from clear to amber, swish pan in a slow, circular motion. Remove pan from heat. It will continue to deepen as you swish. 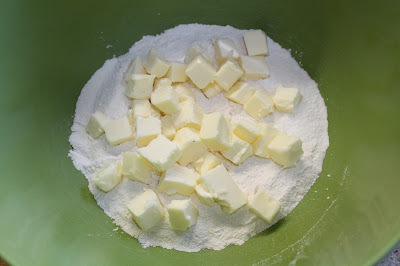 Add in heavy cream. It will bubble, so take care. Add in butter, vanilla extract, and salt. Stir until all ingredients are incorporated. 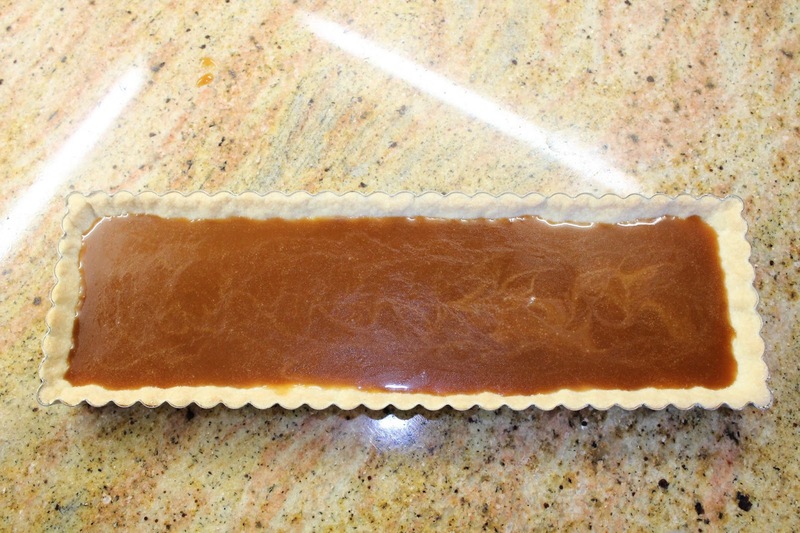 Allow caramel to cool for about 10 minutes. Pour caramel over baked crust. Set aside for about an hour. 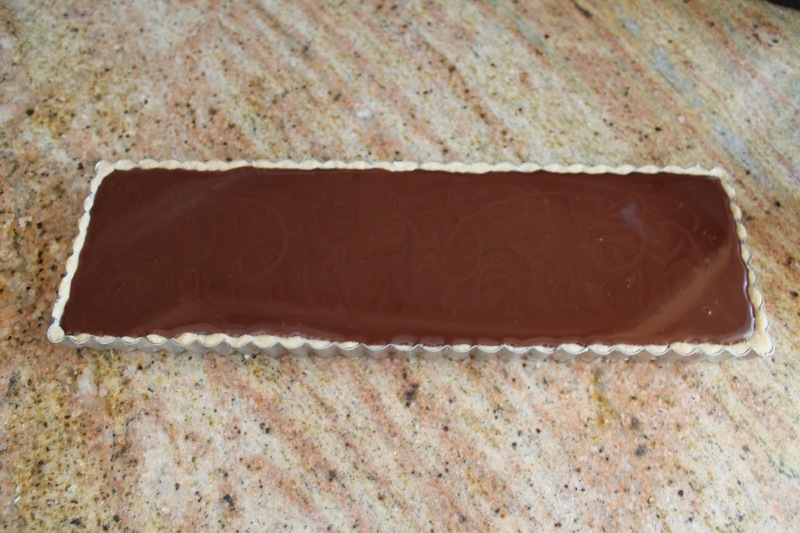 Place chocolate in a large glass measuring cup or container that has a pourable lip. Heat heavy cream in a saucepan. 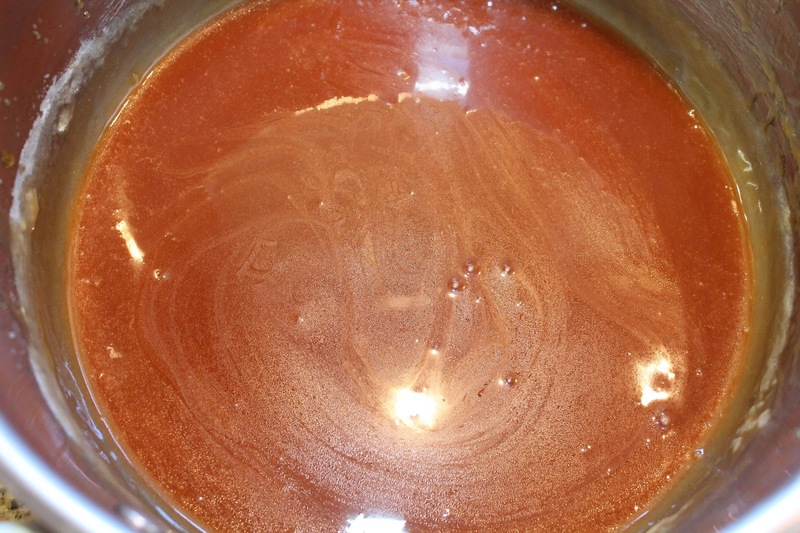 When it comes to a bubbling simmer, remove from heat and pour over chocolate. 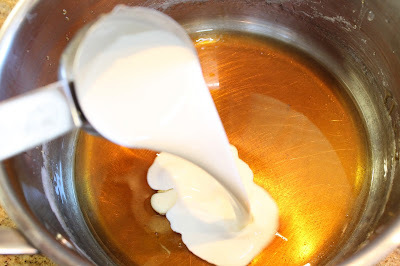 Allow to sit for a couple minutes and stir until smooth and creamy. Allow to come to room temperature. You'll want it to thicken, but still be pourable. Pour chocolate over caramel. 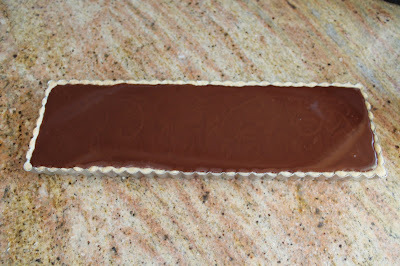 Using an offset spatula, smooth chocolate over top evenly. 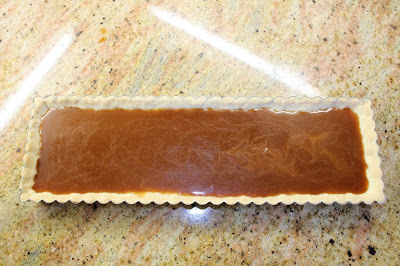 Let tart set for about 20 minutes before transferring to the fridge, uncovered. Chill for 3 hours for best results. Dust with a quality cocoa powder and serve. 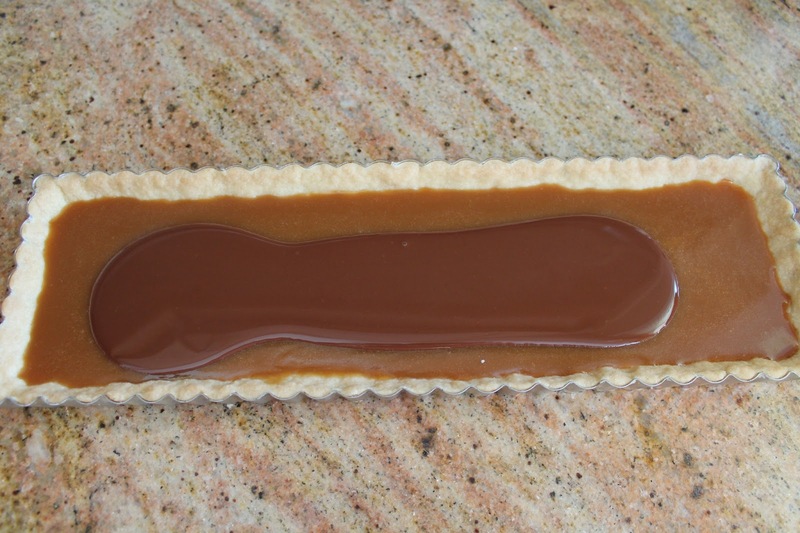 Note: This tart has a gooey caramel filling that will continue to run after cutting. Just prop it up to avoid it oozing out of the tart. 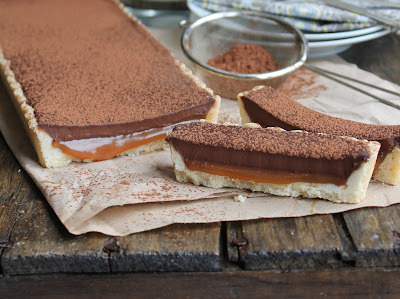 And omg omg omg chocolatey caramely goodness right here hoo mama! Wow this looks so good! And I love the presentation of it in the rectangular pan! I have made something similar with a coconut crust. It is such a amazing combo! What a gorgeous dessert! Thanks for linking up with What's Cookin' Wednesday! Thanks for sharing on Two Cup Tuesday. Pinned it! It looks perfectly decadent! 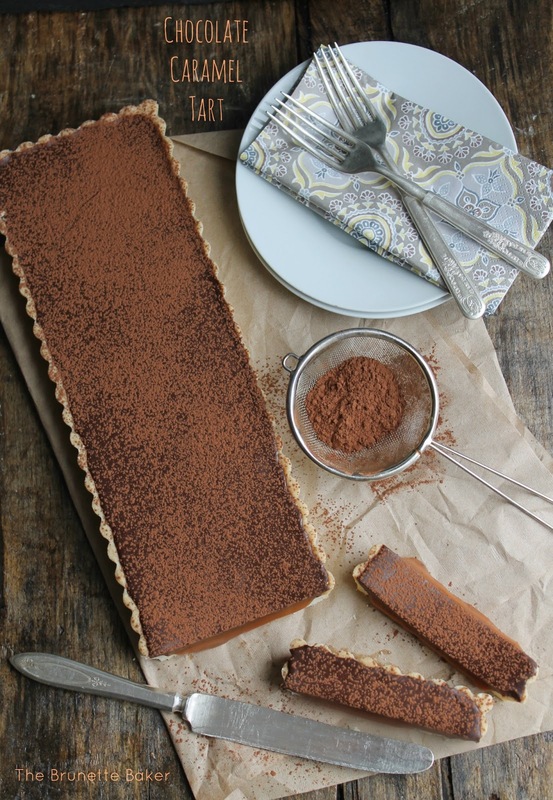 Gorgeous presentation & I love that tart pan!! 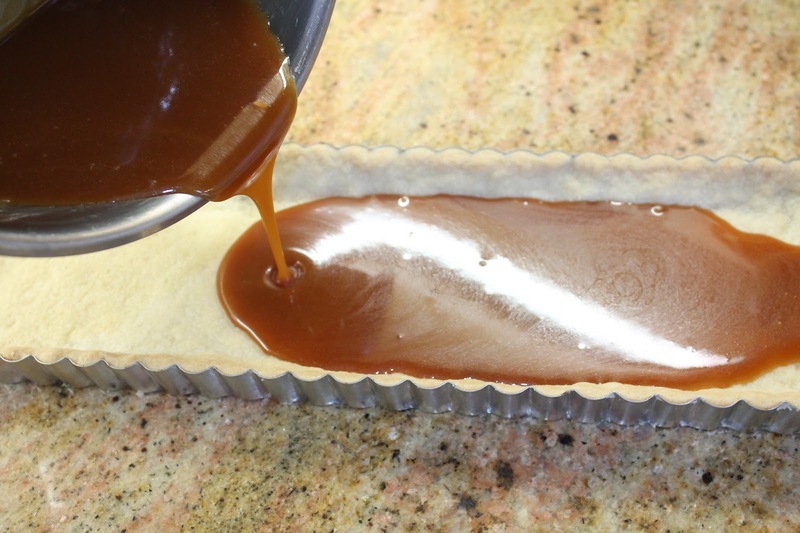 Did you have to use pie weights when you blind baked the tart shell? SO glad I found your blog (via Kitchen Meets Girl). Pinning this recipe. Thanks so much for sharing your post at the Say G'day Saturday linky party. I will be featuring you at this week's party. omg that is all kinds of wonderful!